MicroRNA-134, Pulmonary embolism, Altitude, Biomarker. Pulmonary Embolism (PE) is the third most common cause of cardiovascular death after myocardial ischemia and stroke. Thus, early and accurate diagnosis of this condition is essential to offset the high mortality and poor prognosis that may result from a delayed diagnosis . Much effort has been made to identify molecular biomarkers with high diagnostic sensitivity and specificity for PE. Micro RNAs (miRNAs) are an endogenous class of small non-coding RNAs widely present in the eukaryotes, and they can regulate gene expression at the post-transcriptional level by binding to the 3’-untranslated region (3’-UTR) of target messenger RNAs (mRNAs). It has now become clear that miRNAs are involved in a wide variety of biological processes, such as cell division and proliferation, angiogenesis, and cell metabolism [2,3]. Circulating miRNAs have been shown to be stable and resistant to enzymatic decomposition, making them promising diagnostic biomarkers for various diseases, such as tumors, cardiac failure, myocardial infarction, and spinal cord injury [4-9]. However, the diagnostic value of miRNAs in PE patients still remains unclear. miRNA-134 has been reported to be a potential plasma biomarker for acute PE . Moreover, miRNA-134 expression was significantly increased in patients with stroke and myocardial infarction, both of which were induced by ischemia/hypoxia . However, whether hypoxia may induce high expression of miRNA-134 remains unclear. PE is a common disease in high altitude areas with harsh environmental conditions, such as hypobaric hypoxia, extremely cold and dry, and intensive ultraviolet. It is imperative to develop simple and non-invasive biomarkers for the diagnosis of PE in middle and high altitude areas. In this study, we measured plasma miRNA-134 levels in PE patients in middle and high altitude areas to determine its clinical utility as a diagnostic biomarker for PE. Acute and chronic PE patients and healthy controls were recruited from March 2014 to July 2017 in Xining (2260 m, middle altitude) and Yushu (3600 m, high altitude) in China, with 20 subjects in each group (n=20). There was no significant difference in the gender and age between PE patients and healthy controls (p<0.05). All subjects underwent the same routine examinations, including blood routine examination, blood gas analysis, measurement of plasma Ddimer levels, Electrocardiogram (ECG), heart color ultrasound, vascular ultrasound of both lower limbs, and chest x-ray screening. PE was diagnosed according to the “Guideline on Diagnosis and Treatment of Pulmonary Thromboembolism” published by the Respiratory Branch of Chinese Medical Association in 2001 and confirmed by CT pulmonary angiography. Acute PE was defined as the onset of illness less than one month, while chronic PE was defined as the onset of illness more than three months. Patients with primary pulmonary hypertension, severe infection, malignant tumors, acute coronary syndrome, and psychosis were excluded. Healthy controls with a history of hypertension, diabetes, coronary heart disease and other severe diseases were also excluded. The study protocol was approved by the Ethics Committee of Qinghai Provincial People’s Hospital, and all participants gave informed consent before enrolment in this study. Fasting blood samples (4 ml) were collected from all subjects in the morning in an EDTA anticoagulated tube. Plasma was extracted by centrifugation at 4°C and then stored at -80°C. Total RNA was extracted using TRIzol (Invitrogen) according to the manufacturer's instructions. The Optical Density (OD) was determined using an ultraviolet spectrophotometer (A260/ A280). The concentration and mass of the total RNA were measured using agarose gel electrophoresis. The samples with an OD of 1.8~2.0 and a concentration of ≥ 2 μg/μL were stored for subsequent experiments. RNA templates were thawed on ice and their concentration was adjusted to 2 μg/μL. Template cDNA was synthesized using a TIANGEN FastQuant RT Kit (Tiangen, Beijing, China) according to the manufacturer's instructions, and used for subsequent real-time quantitative PCR. Plasma miRNA-134 levels were measured by real-time quantitative PCR with Taqman probes. PCR system (10 μL) contained 5 μL of Taq PCR Master Mix (Applied Biosystems), 1 μL of template cDNA, and 0.2 μL of target gene miRNA-134 and reference gene U6 forward and reverse primers. Real-time PCR was performed on ABI 7500 system under following conditions: 95°C for 5 min, 95°C for 5 s, 60°C for 20 s, 40 cycles. The cycle threshold (Ct) values were calculated using the SDS 1.4 software (Applied Biosystems), and the miRNAs expression was normalized using the 2-△△Ct method. All statistical analyses were performed with SPSS 17.0 for Windows (SPSS Inc). Data were expressed as mean ± standard deviation. Significant differences between groups were analysed using one-way Analysis of Variance (ANOVA), followed by the Least Significant Difference (LSD) test. The diagnostic value of miRNA-134 was evaluated using the Receiver Operating Characteristic (ROC) curve. The area under the ROC curve (AUC), the optimal cut-off point, and other relevant parameters, such as sensitivity and specificity, were calculated. P<0.05 was considered statistically significant. There were no significant differences in the age and gender between acute and chronic PE patients and healthy controls in middle and high altitude areas (p>0.05). Acute and chronic PE patients and healthy controls in high altitude area had higher red blood cell count, hemoglobin concentration, hematocrit and pulmonary artery pressure but lower oxygen partial pressure and blood oxygen saturation than their counterparts in middle altitude area (p<0.05). In both middle and high altitude areas, PAP was the highest in patients with acute PE, followed by patients with chronic PE and healthy controls (p<0.05); while oxygen partial pressure and blood oxygen saturation were the lowest in patients with acute PE, followed by patients with chronic PE and healthy controls (p<0.05, Table 1). Note: *p<0.05 compared with their counterparts in middle altitude area; △p<0.05 compared with patients with chronic PE at the same altitude; #p<0.05 compared with healthy controls at the same altitude. Table 1: Comparison of clinical data among different groups (n=20). In both middle and high altitude areas, plasma D-dimer levels were the highest in patients with acute PE, followed by patients with chronic PE and healthy controls (p<0.05). However, there were no significant differences between acute and chronic PE patients and healthy controls in high altitude area and their counterparts in middle altitude area, respectively (p>0.05, Table 2). Note: *p<0.05 compared with healthy controls; △p<0.05 compared with patients with chronic PE. Table 2: Comparison of plasma D-dimer levels among different groups (μg/ml, n=20). In both middle and high altitude areas, plasma miRNA-134 levels were the highest in patients with acute PE, followed by patients with chronic PE and healthy controls (p<0.05). In addition, plasma miRNA-134 levels were significantly higher in acute and chronic PE patients and healthy controls in high altitude area than in their counterparts in middle altitude area, respectively (p<0.05, Table 3). Note: *p<0.05 compared with healthy controls; △p<0.05 compared with patients with chronic PE; #p<0.05 compared with their counterparts in middle altitude area. Table 3: Comparison of plasma miRNA-134 levels among different groups (n=20). 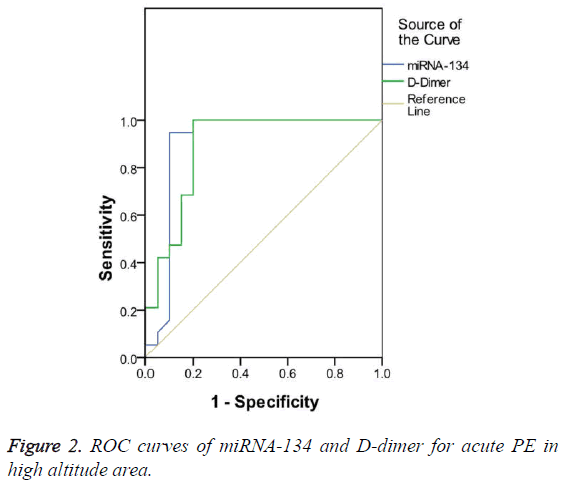 The diagnostic value of miRNA-134 and D-dimer for acute PE patients in middle altitude area was compared based on the ROC curve. The results show that the AUC was 0.836 and 0.829 for miRNA-134 and D-dimer, respectively, both of them had significant diagnostic value for acute PE (p<0.05). However, miRNA-134 had a slightly larger AUC than D-dimer (Figure 1). The optimal cut-off value for the diagnosis of acute PE in middle altitude area was 0.77 and 7.25 μg/ml for miRNA-134 and D-dimer, respectively. miRNA-134 had a lower sensitivity but a higher specificity than D-dimer (Table 4). Table 4: Comparison of miRNA-134 and D-dimer for the diagnosis of acute PE in middle altitude area. Figure 1: ROC curves of miRNA-134 and D-dimer for acute PE in middle altitude area. AUC was 0.904 and 0.889 for miRNA-134 and D-dimer, respectively, both of them had a significant diagnostic value for acute PE (p<0.05). However, miRNA-134 had a larger AUC than D-dimer (Figure 2). The optimal cut-off value of miRNA-134 and D-dimer for acute PE in high altitude area was 1.62 and 9.51 μg/ml, respectively, and miRNA-134 had a lower sensitivity but a higher specificity than D-dimer (Table 5). Table 5: Comparison of miRNA-134 and D-dimer for the diagnosis of acute PE in high altitude area. Figure 2: ROC curves of miRNA-134 and D-dimer for acute PE in high altitude area. Early diagnosis of PE has attracted increasing attention due to its high incidence, mortality and disability. However, PE may be misdiagnosed because of its non-specific clinical presentation, and specific and sensitive diagnostic biomarkers for acute PE still lack [11,12]. Currently available methods for the diagnosis of acute PE include probability evaluation, auxiliary examinations such as arterial blood gas analysis and plasma D-dimer measurement, and imaging diagnosis such as chest X-ray, color Doppler ultrasound and pulmonary angiography. However, the clinical application of these methods can be severely limited. miRNAs contribute to post-transcriptional regulation of genes [13,14]. Circulating miRNAs isolated from the serum or plasma has been shown to be stable and highly predictive of various diseases [15-18]. miRNA-134 was suggested as a new biomarker for the diagnosis of acute PE . In this study, our results showed that miRNA-134 had high sensitivity and specificity for the detection of acute PE. D-dimer has a higher sensitivity but a lower specificity as it can affected by multiple factors such as infection, tumors and various inflammatory diseases [1,20]. Thus, plasma miRNA-134 could serve as a promising biomarker for differential diagnosis of acute PE. However, miRNA-134 level is related to risk factors of heart failure, an thus it may be a potential predictor of myocardial infarction [21,22]. miRNA-134 levels are also closely associated with nervous system diseases [23,24]. Thus, cardiovascular system diseases and nervous system diseases should be excluded in the diagnosis of acute PE to obtain accurate diagnosis based on miRNA-134. Hypobaric hypoxia may contribute significantly to the higher miRNA-134 levels in patients in high altitude area. Previous study showed that miRNA-134 levels significantly increased in patients with stroke and myocardial infarction, of which the pathogenesis is related to ischemia/hypoxia . Thus, hypoxia has the potential to induce high expression of miRNA-134. However, the underlying mechanism remains unclear and needs further investigation. Our study has several limitations. One potential limitation concerns the small sample size. However, we were unable to access a larger number of participants due to small population in this area. In addition, the relationship between hypoxia and miRNA-134 remains to be elucidated. In conclusion, our results demonstrated that plasma miRNA-134 can be a promising diagnostic biomarker for acute PE patients in middle and high altitude areas. More studies are needed to provide further evidence to support our conclusion. The study was supported by the Basic Research Project of Qinghai Science and Technology Department (No. 2014- ZJ-763). Torbicki A, Perrier A, Konstantinides S. Guidelines on the diagnosis and management of acute pulmonary embolism: the Task Force for the Diagnosis and Management of Acute Pulmonary Embolism of the European Society of Cardiology (ESC). European Heart J 2008; 29: 2276-2315. Hwang HW, Mendell JT. MicroRNAs in cell proliferation, cell death, and tumorigenesis. Br J Cancer 2006; 94: 776-780. Jovanovic M, Hengartner MO. miRNAs and apoptosis: RNAs to die for. Oncogene 2006; 25: 6176-6187. Schwarzenbach H, Hoon DS, Pantel K. Cell-free nucleic acids as biomarkers in cancer patients. Nat Rev Cancer 2011; 11: 426-437. Hachisuka S, Kamei N, Ujigo S, Miyaki S, Yasunaga Y. Circulating microRNAs as biomarkers for evaluating the severity of acute spinal cord injury. Spinal Cord 2014; 52: 596-600. Mitchell PS, Parkin RK, Kroh EM. Circulating microRNAs as stable blood-based markers for cancer detection. Proc Nat Acad Sci USA 2008; 105: 10513-10518. Peng L, Chun-guang Q, Bei-fang L. Clinical impact of circulating miR-133, miR-1291 and miR-663b in plasma of patients with acute myocardial infarction. Diagn Pathol 2014; 9: 89. Zhao DS, Chen Y, Jiang H. Serum miR-210 and miR-30a expressions tend to revert to fetal levels in Chinese adult patients with chronic heart failure. Cardiovasc Pathol Off J Soc Cardiovasc Pathol 2013; 22: 444-450. Hsu A, Chen SJ, Chang YS, Chen HC. Systemic approach to identify serum microRNAs as potential biomarkers for acute myocardial infarction. Biomed Res Int 2014; 2014: 418628. Chi W, Meng F, Li Y. Downregulation of miRNA-134 protects neural cells against ischemic injury in N2A cells and mouse brain with ischemic stroke by targeting HSPA12B. Neuroscience 2014; 277: 111-122. Kearon C. Diagnosis of pulmonary embolism. Canadian Med Assoc J 2003; 168: 183-194. Stein PD, Fowler SE, Goodman LR, Gottschalk A, Hales CA. Multidetector computed tomography for acute pulmonary embolism. N Engl J Med 2006; 354: 2317-2327. Chen X, Ba Y, Ma L, Cai X, Yin Y. Characterization of microRNAs in serum: a novel class of biomarkers for diagnosis of cancer and other diseases. Cell Res 2008; 18: 997-1006. Hobert O. Gene regulation by transcription factors and microRNAs. Science 2008; 319: 1785-1786. Wang K, Zhang S, Marzolf B. Circulating microRNAs, potential biomarkers for drug-induced liver injury. Proc Nat Acad Sci USA 2009; 106: 4402-4407. Rong H, Liu TB, Yang KJ, Yang HC, Wu DH. MicroRNA-134 plasma levels before and after treatment for bipolar mania. J Psychiatr Res 2011; 45: 92-95. Alevizos I, Illei GG. MicroRNAs as biomarkers in rheumatic diseases. Nat Rev Rheumatol 2010; 6: 391-398. Ai J, Zhang R, Li Y. Circulating microRNA-1 as a potential novel biomarker for acute myocardial infarction. Biochem Biophys Res Commun 2010; 391: 73-77. Xiao J, Jing ZC, Ellinor PT. MicroRNA-134 as a potential plasma biomarker for the diagnosis of acute pulmonary embolism. J Transl Med 2011; 9: 159. Agnelli G, Becattini C. Anticoagulant treatment for acute pulmonary embolism: a pathophysiology-based clinical approach. Eur Resp J 2015; 45: 1142-1149. Gacon J, Kablak-Ziembicka A, Stepien E. Decision-making microRNAs (miR-124, -133a/b, -34a and -134) in patients with occluded target vessel in acute coronary syndrome. Kardiologia Polska 2016; 74: 280-288. Hoekstra M, van der Lans CA, Halvorsen B. The peripheral blood mononuclear cell microRNA signature of coronary artery disease. Biochem Biophys Res Commun 2010; 394: 792-797. Gao J, Wang WY, Mao YW, Graff J, Guan JS. A novel pathway regulates memory and plasticity via SIRT1 and miR-134. Nature 2010; 466: 1105-1109. Jimenez-Mateos EM, Engel T, Merino-Serrais P. Silencing microRNA-134 produces neuroprotective and prolonged seizure-suppressive effects. Nat Med 2012; 18: 1087-1094.